A shirt and hat will be sold to raise funds for the Josh Frederick Foundation. The Josh Frederick Foundation is now in the final organization stages. Getting the charitable foundation setup is a challenge but it will be worth it for everyone. The Josh Frederick Foundation will assist the Frederick family in moving forward in an effort to help Josh on his comeback and to promote spinal cord research. The group setting it up believes that all the account info will come later this week as will the website. As it comes we will post it and get everyone in the loop. 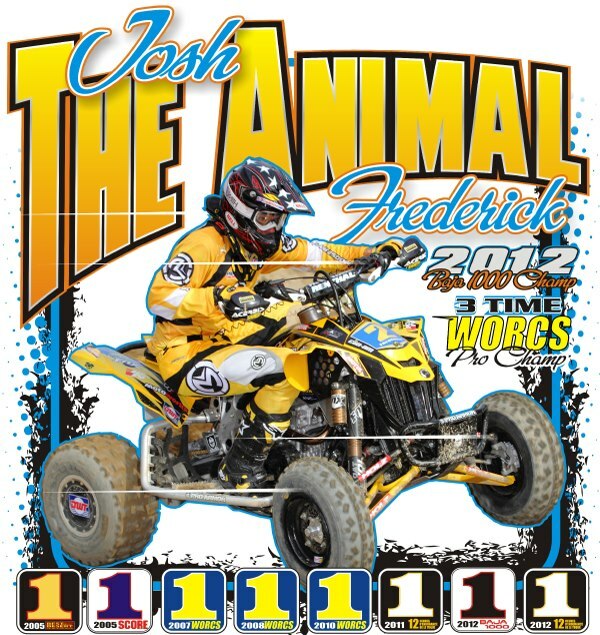 A Josh The Animal Frederick shirt will be available at Rnd 4 WORCS at Sand Hollow and will be available to pre-order this week. A hat will also be available for purchase. You can see some of the art work in this release and more will be coming. 100% of all proceeds will go towards the foundation. On Saturday June 8th there will be a ride day at Cahuilla Creek Mx in Anza, Ca to benefit the Josh Frederick Foundation. The day will be a full of fun activities for the family. Motocross practice will be available, a family poker run with prizes stashed along the way, a music band, pit crew competition, awesome barbecue and finally a silent action with some of the industries most valuable items. On March 24, 2013 Josh Frederick suffered a T5 fracture and has lost feeling in the lower half of his body. He had successful surgery to remove the bones from his spinal column and is currently undergoing rehabilitation daily. It is there that you can see the Animal is still very present. Josh is joined by his wife Tiffany and their three children Madeline, Gavin, Jaxson and the entire Frederick family.